Cutter keeps a record of the files opened during each work session. The information is stored in the Cutter_Prefs directory. However, Cutter only records the most recent 50 sessions. 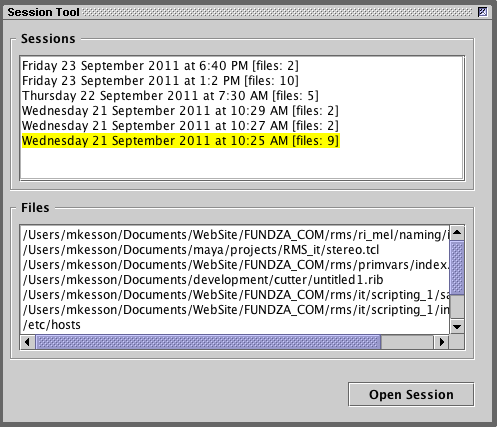 The Sessions Tool is available from the File menu. The popup menu in the "Favorites & Recent" panel now displays a list of the directories visited during the current work session. Ribs generated by the Rman Tool->Docs menu now begin with the following Option. 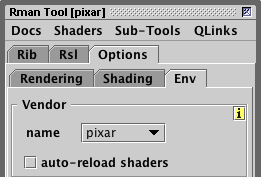 However, the Option is only added if the Rman Tool->Options->Env->Vendor is set to "pixar". for information about the Options that Cutter adds to the shadow pass ribs that it generates. It is often useful to open the perspShape_Final.0001.rib in Cutter for the purposes of making manual edits followed by rendering the rib with Cutter. RMS ribs have a Display statement of the following form. To avoid the necessity of manually replacing the "mayaiff" display driver with "it", Cutter now automatically performs the replacement when the rib is rendered using control + e, alt + e or Apple + e. Automatic substitution can be "turned off" by the preference shown below. Mel and Slim documents can now be executed when displayed in a history window. However, Maya must first be set to be listening on a port - refer to the following tutorials for more information about "sending" mel and slim scripts to Maya and Maya/RMS.